Yes, the job is stressful and after years of frequent deployments and moves we're ready to establish a permanent home. As long as I remain on active duty I'm constantly vulnerable for another 6 month deployment or year long remote away from the family. I can't justify putting them through yet another separation and/or additional move when I'm already retirement eligible and have so much saved. I've got plenty of ways to fill my time if I don't manage to find a second career. Your expenses are the part missing from this thread. No one can give you an accurate answer without those details. Your pension may be enough or may be a drop in the bucket depending on your lifestyle / expenses now and in the future. Hungryone, thanks for the perspective. I was beginning to worry I was an outlier for thinking there's better things in life than a job. At this point I'm eager to spend more time with my kids than I do at work. I'd also really like the time to be more involved in community and perhaps pursue a hobby. that stuff sounds delightful to me. I can't wait to volunteer at the animal shelter every week. I already do it but I would love to step it up. I also am excited about having fewer constraints on taking continuing education. As for mortgage, I'm thinking we can easily swing $1k monthly payments leaving $3600 for expenses before tapping savings/investment s. Pension increases for inflation annually while mortgage remains static and a diminishing share of annual income. Considering putting up to $200k down on $350-400k home to keep payments affordable. Thats previous home equity/savings set aside for home purchase not included in $1.2m. Currently stuck renting only expected to remain at this location 2-4 years and no intention to stay longer term. I might be able to get better returns investing that $ instead but that significantly increases risk. Thanks for your service. My spouse is a Gen X vet. Too many people (especially men) tend to define themselves solely through a job...their entire identity is wrapped up in what they do for a living. The routine and repetition of work can become a substitute for what I'd call a "real life" of satisfying, emotionally rewarding, pleasant things filling your day. It's like if they're not working, they don't exist. You've busted arse for years in circumstances that most people actively avoid, and now you're sitting on a pile of cash. Continue being thrifty, take those kids & wife on a long, extended camping trip to some national parks, and keep on keeping on. Spending lavishly on your children is no substitute for actually spending quality time with them. Plenty of people out there are insanely jealous of your position. Like I said upthread, you are well positioned to take a few years off, enjoy yourself, and re-enter the workforce when you are good and ready. Your local VFW probably could fill some hours, too. Plenty of vets around these days who need support & community. Why is the post above eliciting so many down votes? I don't get this place sometimes. Don't attempt to understand it. The board has evolved a lot in the last few years, particularly with the emergence of crypto and the LSUS MBA support group. As for mortgage, I'm thinking we can easily swing $1k monthly payments leaving $3600 for expenses before tapping savings/investment s.
having a mortgage in retirement isn't that big of a deal, assuming you have the cash to pay it off. It offers an inflation hedge, not to mention rates are historically low. What I was trying to say, is there is no reason to stay busy for free. If all you did was work for yourself and make money that's one thing, but you've been in the military and there are plenty of things you can do to be a productive citizen and still make some money. Or make money doing your hobby. Lot of retired military do things like run a Scuba dive shop for example. I was simply suggesting finding something you enjoy AND can make some money. Its one thing to have a job to support yourself, its a whole different thing to have a job to supplement your income. As I'm sure you know, they are very expensive, and God knows how much college will be in 15 years. If it's not already, college will be useless in 15 years outside of a specialized degree (Dr, Lawyer, Engineer, STEM). Don't force your kids to go just because you can afford it or have been saving for it. Also, do you have any GI Bill benefits to pass down? This will help at least the oldest and then you're only left footing the bill for one. If it's not already, college will be useless in 15 years outside of a specialized degree (Dr, Lawyer, Engineer, STEM). I’ll take that bet. All those liberal arts schools better pack up shop and give up. College is still one of the best investments one can make early on life. The doors it opens are unsurpassed. The majority of high paying jobs require at least a BA even those that are not STEM, legal, or medical. I haven’t done the analysis, but I’m intrigued at what the break even point would actually be for a college degree. My presumption is it would be much greater than the cost today - likely as high as $400-500K for undergrad alone. A graduate degree likely has a similar or higher break even point. When the market requires a college degree as an entry point into a large number of professions, it inflates the value of the degree even if the skills learned are not viewed as directly applicable. College as a requirement is more about the signaling effect than it is about the actual material learned (with the exception of technical fields). Very good point and well stated. The material "learned" may be arbitrary, but the representation of learning that materiel is where the value is (potential future earnings, etc.). Which is kind of arse backwards if you think about it. All I know is I wake up everyday at 26 years old beyond grateful that the GI Bill put me through business school with zero student loan debt. I honestly don't know why some people do it and I'm not just talking about Sally the Liberal Arts Major either. I know plenty of general business majors loaded with student debt for degrees that apply very little to their actual jobs. Did it help them get their jobs? Absolutely. Was it worth digging the hole, I guess that's up to the individual. My perspective is skewed because I have worked directly next to executive levels individuals at high growth startups. If there's anything that teaches you it's that there is little practical knowledge learned in any undergraduate business program that prepares you for real business. It's much more self awareness, psychology, and strategic communication. All things learned through trial and error not in a classroom. Maybe my comment should have been that the modern college education will be useless in building financial freedom outside of those specialized fields 15 years from now. If mom and dad or the school are gonna pay for it, extend the party. If it's on you, I'd think real hard. It's much more self awareness, psychology, and strategic communication. All things learned through trial and error not in a classroom. I'd argue that the casually disparaged liberal arts majors are learning about self awareness, psych, and communications skills not emphasized in B schools. A solid LA degree from a quality school teaches you to read critically, think, write & speak well. Note that I said a GOOD SCHOOL....way too many inferior institutions offering terrible programs w/rampant grade inflation. The bigger point here is: what does a parent "owe" his/her children? A paid-for college education, a paid-for wedding? A down payment toward their first house? Many people raise productive, happy children without guaranteeing them those things. "Lawnmower" parenting--eliminating all obstacles, like having to pay one's own way--is the new helicopter parenting. So perhaps OP feels like his nest egg, earned through his own sweat & frugality, is enough: he's gonna teach his kids to earn their own, without handing them a bunch of material things....or missing another chunk of their childhoods chasing more material things. Amen. As a society (I'm talking from my viewpoint as an engineer), I hope we change our attitude and focus on technical degrees and on-the-job-training. The spending on education is out of control and only contributes the debt-based slave society we have in general these days. I'd love the opportunity to take the hardest working, smart kids I could find in HS and just teach them on the job. I think they would be much better engineers for it and I think their quality of life would be better along with being able to lower the cost of engineering. The control aspect to this would be adding to the requirements needed to get your PE. You'd need more time under a PE and maybe another exam or two along the way to verify knowledge. I plan to nudge my kids towards technical degrees that pay well but have a great work/life balance that allows them to be happy w/out dealing with debt. I know were getting away from the OP's post, but that's what happens 5 pages in. I agree completely. The coolest thing about the college I went to is the emphasis they placed on cooperative learning. I worked at the National Institute for Aviation Research my junior and senior year. Only business major in the building. Knew nothing about calibration or testing on load machines, but I learned and we were doing work for nearly every aviation company in the world. Even though I wasn't an engineer, I was offered a business role job at Textron out of school almost entirely because of that experience. We even had cooperative internships that allowed students to get paid and earn 3 credits. That kind of stuff is super valuable and should be more prevalent. I haven’t done the analysis, but I’m intrigued at what the break even point would actually be for a college degree. My presumption is it would be much greater than the cost today - likely as high as $400-500K for undergrad alone. 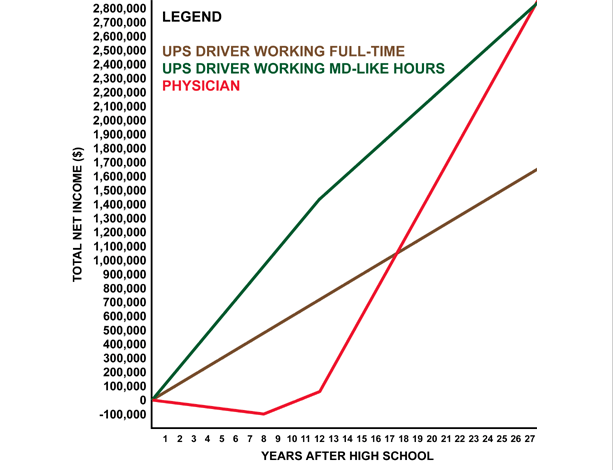 A graduate degree likely has a similar or higher break even point. As previously stated, I've transferred GI Bill to my kids. Each gets half. They also have $10k each in 529s. We want them to have skIn in the game. They'll earn scholarships and/or work their way through school to pay for the rest. My wife and I didn't get where we are through handouts from our parents. I'm not planning our future around providing lavish weddings and sweet 16 parties. The concept of paying my childrens' home down payments never even crossed my mind. I believe the wealth of experiences I can provide them when I have more time beats further monetary/material contributions I could provide working full-time.